Constructed from weatherproof plastic, resin patio furniture is a long-lasting, eco-friendly alternative to traditional wood. Because the material is supremely resistant to rain, snow, wind and sun, it will retain its coloring and quality for years to come. Resin furniture is an ideal option for beachside bungalows because the material can withstand heavy sun and salt exposure. 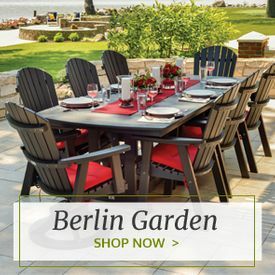 We carry a vast assortment of stylish resin outdoor furniture ranging from brightly colored resin chairs to neutral resin tables to help you create a practical yet pleasing outdoor environment that will last a lifetime. 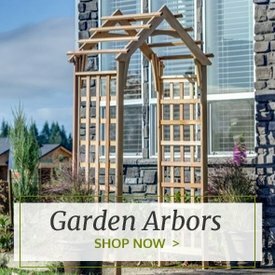 All of these pieces are constructed using non-porous, recycled plastic and come with generous warranties. A great choice for high-traffic backyards and businesses alike, our resin chairs are soundly constructed and artistically inspired. 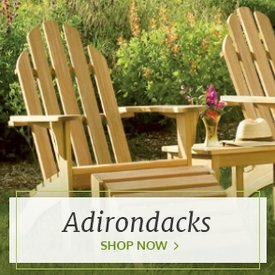 Resin Adirondack chairs in yellow, blue, red, brown, white and an array of other colors provide a comfortable and tasteful seating option with an incredibly durable appeal, while our resin chaise chairs are a great choice for the pool deck because they're built to withstand heavy water exposure. While resin furniture is often brightly colored because it can retain pigments better than traditional wood or other materials, we also carry sophisticated neutral resin chairs, including sand, teak, green and many other options. Busy backyards will benefit from Outdoor Furniture Plus' bountiful assortment of resin dining tables, including sensible garden tables in square, rectangular and round table options. 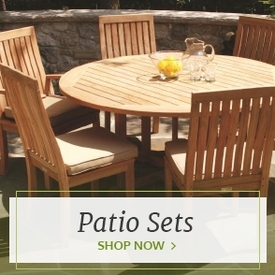 Easy to clean and free of common wood concerns like warping, cracking and splitting, each resin patio table will help you take advantage of the outdoors all year round. 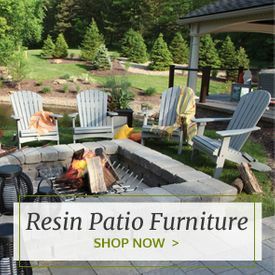 Explore our entire selection to find quaint resin swings, resin gliders and even high-end resin sofas and loveseats for a whole new way to experience outdoor enjoyment.